Thought for the Week: Sweet or Comic? Previous Post Mr McCormack: Never ever! I would choose sweets because comics are for boys not girls. I would rather choose a comic because you can learn from it but sweets will make your teeth rot. I would choose the comics because it makes your imagination better with your literacy. I would choose comics because sweets make your teeth rot also you would get tooth aches nearly everyday. I would choose sweets because I don’t like comics. Comics because you can read them and have a little knowledge. I would rather choose comics because candy has a high level of sugar and then your teeth will rot. Comics because if you eat sweets your teeth would rot. I would choose sweets because I do not read comics. Comics because when you read them there is a little fantasy in them and you can use that fantasy in your literacy. I would choose comics because it helps you read better. I prefer comics because their very good to read. I would rather read comics than only have sweets because comics make me read and sweets are bad for us and we would fall ill. I choose comics because sweets are bad for you’re health. I prefer comics because they are more imaginative than sweets. Really? Why do you think that Jada? I would choose sweets because they last longer and comics are something you read once and never pick up again. I would choose comics because if I would choose sweets I would eat to much sweets and I would feel sick ,but if I had a comic I could relax and read. I choose comic because sweet are sugar in it so comic are nice . I would choose comics because they are interesting and fun to read. Also, sweets are bad for you. I wod choose comic books because it last longer then sweets. 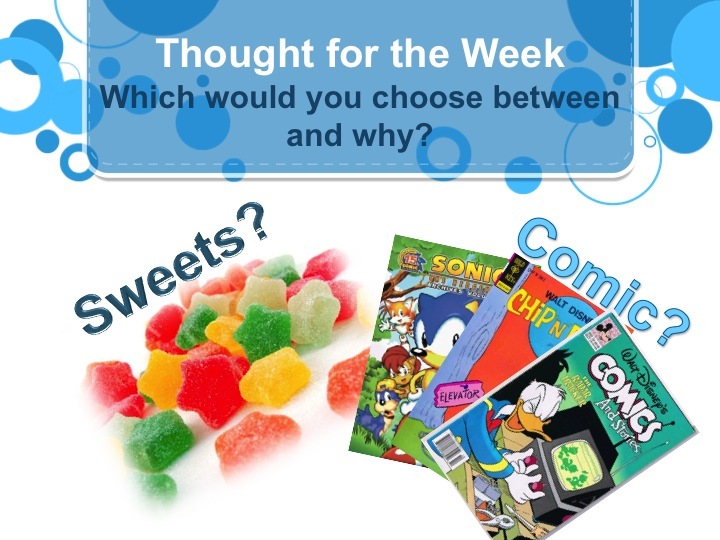 I would choose comic because sweets are bad for you and they will rot your teeth. I would choose the comic because I love to read, it gives you knowledge so you know lots of different kinds of things! I would choose sweets because they taste nice and they are nice to eat.